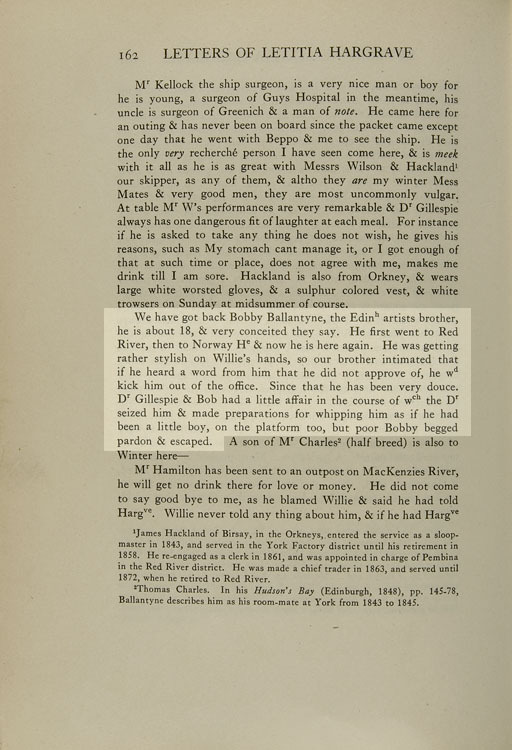 “We have got back Bobby Ballantyne, the Edinburgh artists brother, he is about 18, and very conceited they say. He first went to Red River, then to Norway House and now he is here again. He was getting rather stylish on Willie’s hands, so our brother intimated that if he heard a word from him that he did not approve of, he would kick him out of the office. Read what Ballantyne says about Letitia - enter 'Ballantyne' in the search box to your left. Check the Beaver Index - e.g., type in apprentices, Ballantyne, etc.